Today marks the first day of Halloween in Orlando, Florida, with the opening of Halloween Horror Nights at Universal Studios, the theme park’s festival of renowned haunted houses, created anew every fall. In its 28th year, Universal has upped its house count to 10, the themes ranging from the Poltergeist to Killer Klowns from Outer Space. The most widely anticipated of the bunch, however, focuses on the hit Netflix show Stranger Things. If you’re the kind of twisted freak who would actually want to spend time in Hawkins, Indiana, this is the delightfully spooky attraction for you. 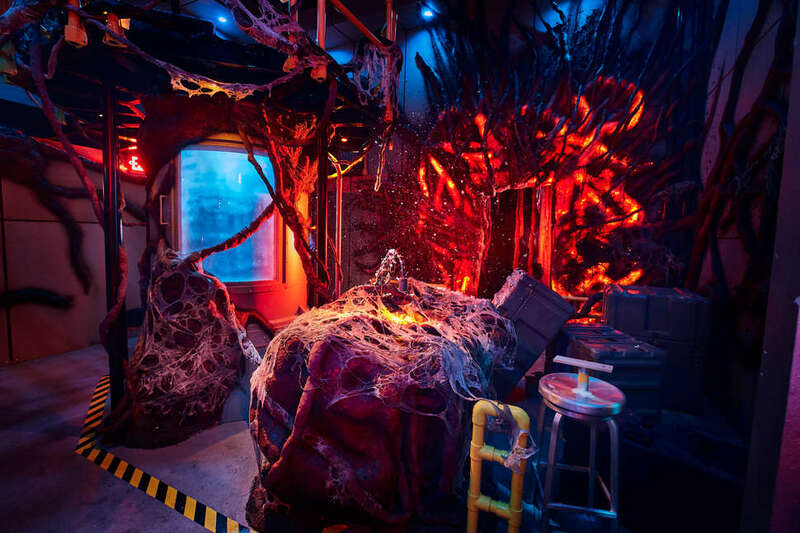 Here’s everything you need to know about the Stranger Things haunted house. Is this like Stranger Things fanfic or is it legit? It's the real deal. Universal has been working closely with Netflix and the Duffer brothers to ensure that all corners of the haunted house are as accurately depicted as possible, going as far as getting blueprints of the set drawings to work off. 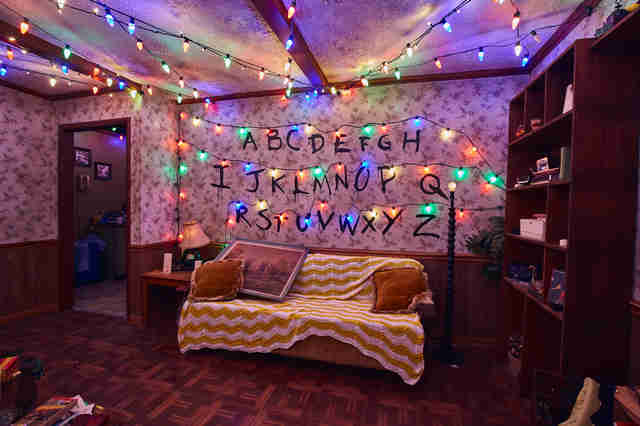 The wallpaper in the Byers’ kitchen and in Will’s bedroom, for example, is the same as in the show; Universal had the Duffers’ vendors send them the digital files of the prints so they could recreate it exactly. Every piece of décor in the Byers’ living room is from before 1984; the infamous Christmas lights strung up are the same brand from the show, and vintage tchotchkes scavenged from local thrift shops adorn the walls. Making your way through the labyrinthine house, you'll weave in and out of the Upside Down. Expect to pass through “portals” (sans goo) and see and feel the fog, spores, and particle matter eerily floating through the air in the forest and laboratory. Will the Demogorgon be there? The Demogorgon is gonna stalk you around every corner. Using both costumed actors (the minimum height requirement for these guys is 6’2”) and life-sized pneumatic puppets, you’ll see everyone’s favorite monster sport a variety of expressions: closemouthed, openmouthed, and roaring his face off. The costumes and puppets were 3D printed to ensure that every Demogorgon is identical. Will any of the actors be there? Sort of. Though you admittedly won’t find any of the actual actors from the series taking you through the house, each of the main characters are portrayed by startlingly on-point lookalikes. Unfortunately, selfies (or photos of any kind) are not allowed inside the haunted house, but feel free to tell your friends that Mike invited you to join the party, anyway. You’ll notice plates of waffles casually placed on the breakfast table in the Byers’ kitchen, but don't eat those -- those are props. But! Universal has whipped up some Stranger Things recipes that they’ll be serving in the park. Our recommendation: The Triple Decker Extravaganza, which mixes Reese’s Pieces, jelly beans, chocolate chips, and whipped cream stacked high on three Eggo waffles. The buffet will have more than just sweet breakfast foods, though. Expect burgers, chicken sandwiches, pizza, nachos, and tons more. When is Halloween Horror Nights? It opens at Universal Studios in Orlando and Hollywood on Friday, September 14, and in Singapore on Friday, September 28, running through Saturday, November 3. Check out all the dates and times, and buy your tickets, here.